Over the last few weeks, there has been a steady increase in playground attendance in Sunset Park. More parents and care-givers are coming with their munchkins in tow, and they are staying for longer periods of time. That's a definite sign of Spring's arrival. It is caused (I think) more by intense cases of cabin fever than pleasant weather. Still, it's nice to see more life in the park. Another sign of upcoming Springtime glory is the appearance of tiny flowers in various nooks of the park. They've shown up kind of randomly so far. 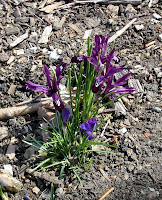 The photo shows a set of crocuses that I haven't seen in the park before. It'll probably be all over the place next week. Oh blessed Spring! It's all I yearn for day and night! Just kidding, but I really am excited to see that photo, I haven't noticed any flowers out, I'll have to be looking now. I think I will be much happier when Sophia and I can leave the house more often and on our timetable instead of the weathers.